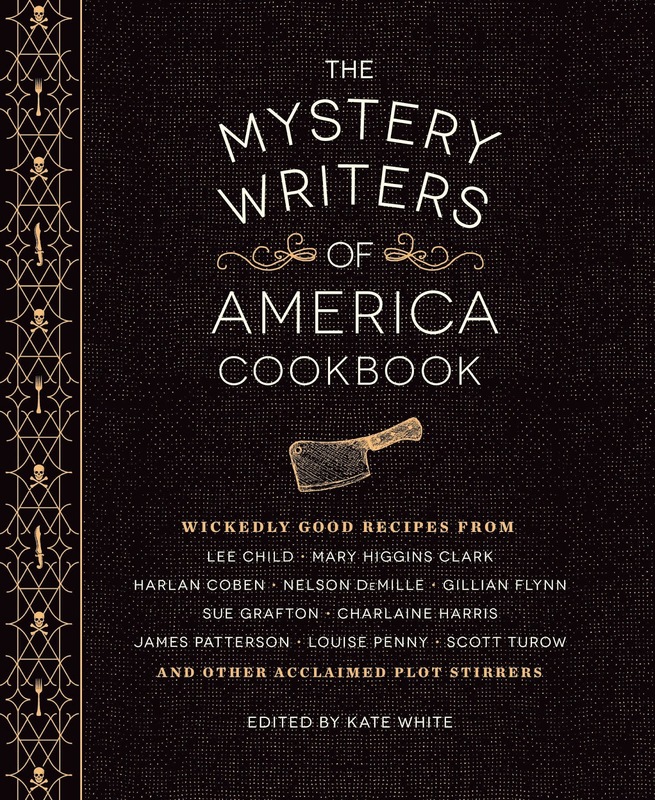 LUCY BURDETTE: We are thrilled, thrilled, thrilled to host Kate White today--she's here to chat about her latest herding-cats project--editing the Mystery Writers of America cookbook. Kate, welcome! Please tell us about the book! KATE WHITE: Because I was both a mystery author and have had experience as an editor—I ran Cosmopolitan magazine for 14 years, and four other magazines before that—MWA asked me to edit the cookbook for them. I loved doing it. True, at moments it was a bit like herding cats to get some of those successful authors to send me their recipes, but I enjoyed having contact with famous writers I’d never met and I also got a kick out of seeing what recipes they submitted. There are also some fun sidebars in the book, which I enjoyed researching and writing, like: What Exactly Is a Red Herring? And “Pretty Poisons Right in Your Garden.” The latter got me thinking about using poison again in a mystery. Only a few toxins are routinely tested for in autopsies, so poison can be a good way to kill someone and never be caught. 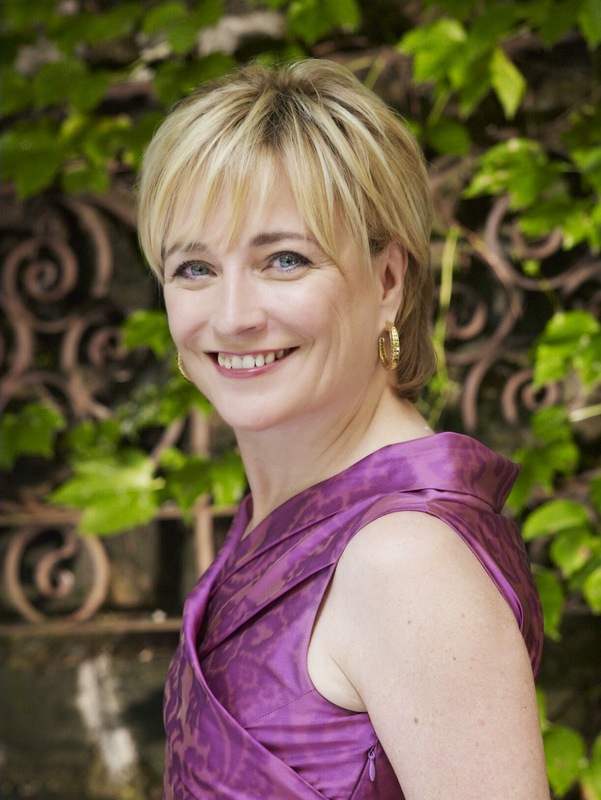 LUCY BURDETTE: Were you surprised at which writers chose what recipes? (Was there a pattern, like hard-boiled=appetizers, cozy=dessert?) What were some of your favorites? There were some wonderful surprises. Gillian Flynn writes such fabulously dark stuff so it took me aback to see her recipe for the very All American-seeming “Beef Skillet Fiesta.” And Nelson DeMille’s funny “Male Chauvinist Pigs in the Blanket” almost made me fall off my chair laughing. Other recipes were like little gifts. For instance, I still remember reading my first J.A.Jance novel year ago (Edge of Evil) and practically smelling the Sugarloaf Café sweet rolls she describes, and lo and behold, she sent in the recipe for them. And thanks to Lorenzo Carcaterra, I finally have my go-to marinara sauce. I’ve actually added a few of the wonderful recipes to my regular repertoire, like Kathy Reich’s “Shrimp Scampi” and Hank Phillippi Ryan’s “Worth-the-Effort Turkey Tetrazzini” (I always wanted to know how to use leftover turkey!). LUCY BURDETTE: Do you like to cook? What menu might you serve at a dinner party? KATE WHITE: I do love to cook and I do it a lot for friends and family. I’m not imaginative but I’m a cookbook addict, and I’m decent at following recipes. I have all the Barefoot Contessa cookbooks, for instance, as well as those by Nigella Lawson and Giada De Laurentiis. We live in Uruguay part of each winter, and my favorite chef is Francis Mallmann, who has a restaurant not far from us. His cookbooks—Seven Fires and On Fire—are fantastic. He believes that charring both meats and vegetables brings out unusual flavors. And he’s right! What I’ve also learned from him is that simple is so often best. Don’t overthink things, use just a handful of ingredients (but be sure they are the best you can find), and don’t fuss with food that’s grilling (let it char!!!). One of my favorite Mallmann dishes is a salad with thinly sliced raw zucchini, almonds, fresh mint, and parmesan cheese, dressed with olive oil and fresh lemon juice. For a summer dinner party, I might serve that first and then do a main course of grilled chicken, which I’ve marinated to death in lemon and oregano for two days, fresh sliced tomatoes, and Tuscan beans. LUCY BURDETTE: Your suspense novel, THE WRONG MAN, will hit bookshelves in June. Tell us a little about that. And is it true that part of the book is set in the Florida Keys? KATE WHITE: The Wrong Man comes out in June, and yes it’s about Islamorada, which I discovered after being invited to a wedding there. In the book, a woman named Kit Finn takes her vacation in Islamorada and ends up having a very brief but thrilling fling with a man who is staying at the same hotel. He’s from New York City, as she is, and he asks her to dinner at his apartment in the city the week they both get back. But when she arrives, the man who opens the door has the same name as the man she met in Florida, but it isn’t him. That begins a nightmare that doesn’t want to quit. LUCY: Kate thanks so much for visiting. Reds, we have a giveaway today--a copy of the MWA cookbook! To be entered in the drawing, leave a comment with your email. WARNING: Don't go any further if you're on a diet! LUCY BURDETTE: Gosh there’s been so much bad and scary news in the world, that I’ve had trouble thinking of something we might blog about. The one thing that kept sticking in my head is a sandwich I ate last week—as research, of course. 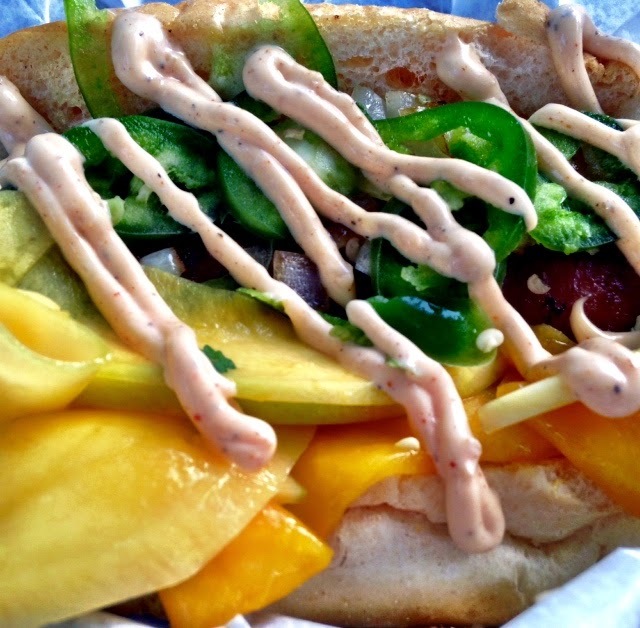 I hadn’t intended to order a mango-jalapeno hot dog at Garbo’s Grill. We went for the shrimp burrito and the fish tacos. But while we were waiting to order, I saw a dog getting carried off—wrapped in bacon, layered with ripe yellow mango, and green peppers, and zig-zagged with the food truck’s special Caribbean sauce. “Hayley Snow would insist on trying that,” I told John, and he agreed. And so we ordered it too. I’ve had a lot of good sandwiches in my life—Cuban mix in Key West, North Carolina barbecue with Molly Weston, meatball hoagies from my home town deli in New Jersey, to name a few—but this dog went right into the sandwich Hall of Fame. So Reds, if you could nominate one sandwich for that honor, what would it be? and do you remember where and when you ate it? RHYS BOWEN: I'm not a fan of the huge, thick, multi-item sandwich that won't fit in my mouth and usually ends up down my front. But I do love bruschetta. And Barbara Peters introduced me to the best bruschetta I have ever tasted at Postino's in Phoenix. You choose your toppings from a long list: mine always include the hot artichoke spread, the smoked salmon, the brie, apple and fig jam and the sheep's cheese with tomato jam. The bread is fabulous (and so is the gluten free bread they serve) and the plate is just right for sharing. My perfect mid-day meal with a friend. HALLIE EPHRON: OMG Rhys that sounds fabulous. I'll BE in Phoenix April 14 and I'm going to have to get over there. I confess to quotidian sandwich favorites: a really good hot dog slathered in mustard and loaded down with sauerkraut; multigrain toast with Peter Pan peanut butter and real (seeded) raspberry jam; a BLT (fresh tomatoes, lots of mayo, Oscar Mayer bacon crisp crisp crisp) on white toast. I often eat an open-faced breakfast sandwich: multigrain toast, whipped cream cheese, and smoked trout. JULIA SPENCER-FLEMING: I'm going to represent Maine with the best sandwich of all, the lobster roll. It may also be the simplest: chunks o' boiled lobster meat, a little mayo, and a fluffy white hot dog bun. The thing that makes a lobster roll great, though, isn't just the ingredients. Sure, anytime you can eat a quarter or half pound of lobster without having to deal with claw crackers and drippy salt water is great. But the fourth secret ingredient is the Maine coast. 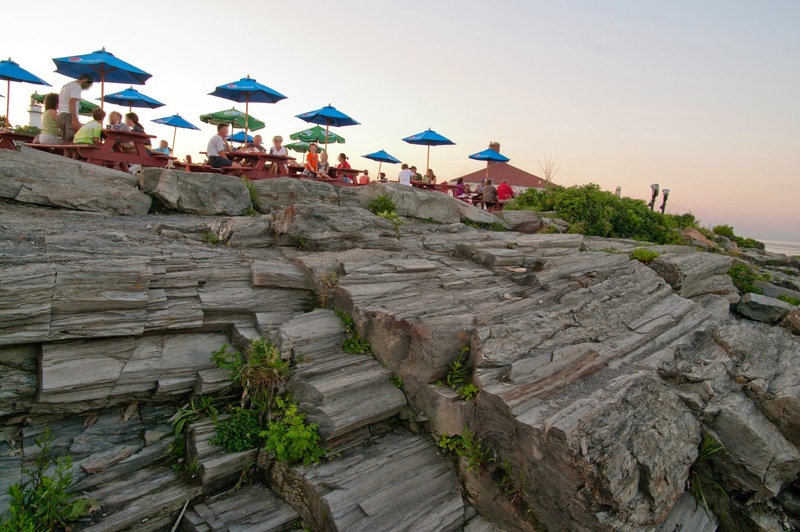 You should always eat a lobster roll in summer, preferably on a sunny day, in sight of the gray rocks and blue water of the Atlantic. Weathered docks leading to boats moored along the Androscoggin or Kennebec rivers can be substituted for the coast, if necessary. HANK PHILLIPPI RYAN: I'm a BLT girl, through and through. Basic BLT, B, L, T, and mayo, on white toast. Now, add avocado. YUM. Add turkey. Yum. Wait, that makes me a club sandwich girl. Another special treat (i'm easy to please) is turkey and cheddar and l/t with honey mustard on whole grain. That is perfect. OH! Tuna salad! With tomatoes, on pumpernickel toast. Ah. Sandwiches. A very sweet way to count blessings when the world is so sad right now. DEBORAH CROMBIE: I'm not much of a sandwich girl. In fact, I'm famous (on infamous) in my family for picking sandwiches apart--tearing off chunks of bread to get to the good stuff. 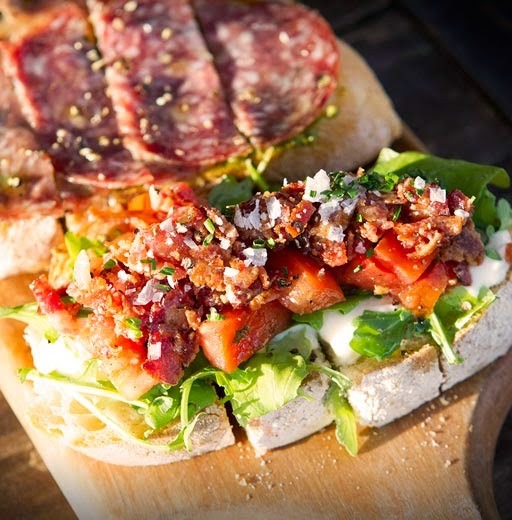 But, like Rhys, I adore bruschetta, especially made on very holey ciabatta. Yum. And I do like a really good BLT. I'll add avocado, but, Hank, leave off the turkey! It spoils the whole crispy bacon/juicy tomato thing. And Julia, I've never had a lobster roll, but I don't think it would take much to win me over! Reds, would you like to nominate a sandwich in your life to the sandwich Hall of Fame? Oh, well, it’s the funniest cartoon I’ve ever seen, and I’m posting it. Hilarious, huh? Kind of? Anyway, the reason it’s relevant today is that author Shannon Baker is getting a puppy! Yay. It’s book launch time for her, and she’s been all over the place talking about Tattered Legacy. 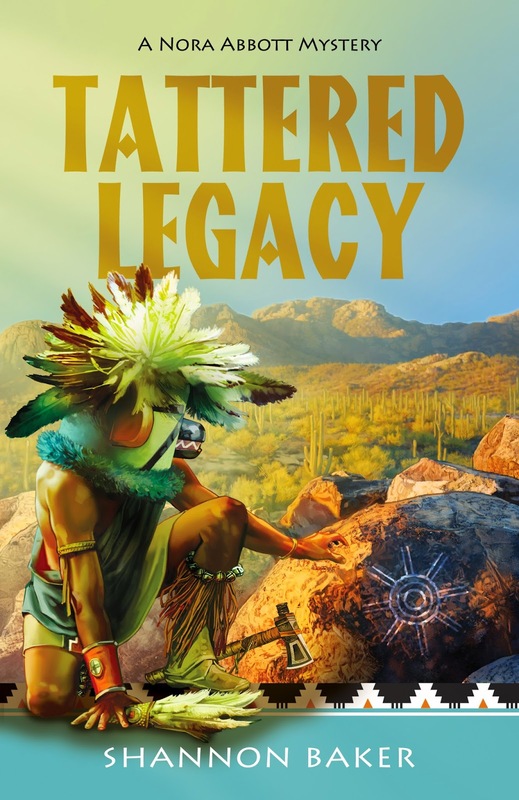 It’s full of Hopi Indian legends, polygamists, aliens, super-wealthy and politically powerful Mormons and more iconic scenery than you can imagine all stuffed into 350 pages—so what’s not to love? But I wonder—is she getting the puppy for book tour? Okay, no, of course not. But she’s as delighted as any puppy-expecting parent… She’s got a new book out, and a puppy on the way. Whoa. I mean, wow. Oh, I mean: Bow wow. SHANNON BAKER: Exactly! But I’m sort of ADD and I wrote that book a while back so, for me, that was then. What is now, though, what has me wiggling in my seat with anticipation, is the NEXT thing in our lives. The Puppy Stork is winging her way to our house, bringing us a bouncing baby bundle of puppy love. 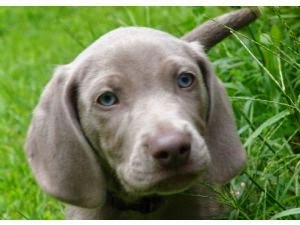 We’re scheduled to pick up our 8-week old Weimaraner girl in mid-May. We lost our last Boxer in 2011 and we’ve been a lonely, sad, dogless couple since then. We ached for a new dog but knew we were destined for a nomadic and pretty chaotic life until we pulled the plug on gainful day jobs and both became stay-at-homes. We made the choice to wait and it’s been a long, desolate trudge, both to the end of the paycheck producing situation and through the puppy drought. Not the ACTUAL puppy...but like this! I cringe to compare puppies and babies. When I had my daughters, I lived in rural Nebraska and the references to me and heifers didn’t make me grin. Dogs aren’t people so I’m not a dog mom. But dogs are a specialness all to themselves. At the same time better but not quite on par with people and the love for pets is deep and real. So, yeah, this has some of the same heart-tugs as bringing a baby home. And as with having babies, I suppose I’ve blocked some of the less desirable details. After all, I did have more than one baby, so I’m obviously pretty good at selective memory. I’m remembering the good parts of puppies. I can’t wait to cuddle and laugh at puppy antics. I am anticipating bonding and having that loyal, loving companion. I’m not focused so much on the housetraining. The books make it sound so easy. They sleep, they wake up, you run them outside to their spot, they go, you praise them, play with them, there are no accidents, they go back to sleep, you repeat the cycle. In two weeks, they’re reliably trained. It’s a vague memory from my last puppy, but I think I followed the books. I don’t remember it being that easy. Then there’s the crate training. Again, the book says it will be a lark. Puppies like their crates. It’s safe and quiet and homey. They will sleep in them all night. No problem. But I think I remember nighttime crying. Shoe loss, furniture damage, holes in the yard, barking. All of these issues are dispatched with positive and preventative training. I find it easy to believe the promises of the puppy book and truly believe our puppy will be nothing but pure joy and will grow into a well-trained, neurosis-free, perfect companion. But then, I write fiction. Speaking of which—Tattered Legacy, the third book in the Nora Abbott Mystery Series is available now at your favorite book venue. There are no puppies in it, but there is an aging golden retriever. And lots of mystery and murder and Hopi, polygamists, aliens, rich Mormons and Moab’s amazing landscapes. HANK PHILLIPI RYAN: We want photos! And meanwhile, who has some puppy advice for Shannon? And what about the puppy's name? So excited for you, Shannon! Shannon says: While Tattered Legacy is available from your favorite online or bookstore, if you’d like to support indie bookstores, you’re welcome to contact Who Else Books atwww.BroadwayBookMall.com. Ron and Nina are the best! And they might have a signed copy to send. Hallie: My new book NIGHT NIGHT SLEEP TIGHT is out! Please check my website http://www.HallieEphron.com to see when I'll be visiting your town..and check it out! Thursday: at the Broward County Public Library! Check my website http://www.HankPhillippiRyan.com for more info. Love to see you there! Rhys: Today at Santa Monica Library 2:30 p.m., then Beverly Hills Library, 5 p.m. Come say hello! Debs: This coming Thursday, March 26th, 6 p.m., at the University of North Texas Willis Library. Tickets are still available for the dinner and book signing here.